Maternal antibodies are those antibodies that are transferred to the puppy or kitten when they receive colostrum milk from their dam only in the first 36 hours of life. After that, even though the breast milk contains many antibodies as well as wholesome nutrients, these antibodies can no longer cross the neonatal intestinal mucosal lining. The colostrum–derived antibodies gradually wane from birth over the three months and most are gone by the age of 14-16 weeks. Until then, what remains in their body is called “residual maternal antibodies”, which are present in decreasing amounts to help protect the pup or kitten against foreign substances and infectious diseases. Vaccinating these youngsters at too young of an age when they have plenty of residual maternal immunity just causes the vaccine antigen(s) to be partially neutralized so that full immunization is not achieved. Thus, the effect of vaccination is incomplete and the puppy or kitten is still at risk of getting one or more of these diseases until the vaccine series is completed once the maternal antibodies have disappeared. Conversely, the period of highest vulnerability to infectious diseases is between 10-14 weeks of age. So, puppies need at least one dose of the multivalent vaccine between 9 weeks and before 12 weeks of age, even though it will only partially immunize them. For kittens, they need one dose between 8-9 weeks of age. Please review my canine and feline vaccination protocols for further information. 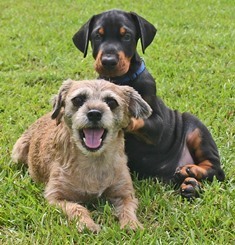 It has been postulated to give puppies or kittens just one dose of multivalent “combo” vaccine at 16 weeks of age, because their maternal immunity will have disappeared and not interfere with complete immunization. It is not safe to leave them unprotected for that long. Maternal immunity will have waned to essentially zero and these puppies will be totally vulnerable to viral diseases.